Pogo sticks are a great source of entertainment or exercise for kids or adults alike. In this guide you will find out how much is a pogo stick and what is the best pogo stick for each age range. What is a pogo stick and why do I need one? How much are pogo sticks? Why is it called a pogo stick? Pogo sticks are a great source of entertainment or exercise for kids or adults alike. A pogo stick is basically a bouncing toy. It looks just like it sounds: the body is composed of a stick with handles at the top and footrests on the bottom. The body of the pogo stick contains a spring that allows the user to propel themselves into the air by jumping on the pogo stick. The goal is to bounce on the pogo stick as many times as you can without losing your balance. Pogo sticks can be a great source of entertainment for kids, and they are an easy way to keep them busy. An extra perk is that pogo sticks are a toy that kids can use alone, so you don't need a group of friends to play. Of course, having friends to play with is always more fun, but this makes the pogo stick a convenient toy for parents looking to keep their kids busy. However, pogo sticks are not just made for kids! Pogo sticks can be fun for adults too - not to mention a great way to burn some calories. You can keep records for the most bounces, have pogo stick races, or maybe (but only with lots of practice) learn some tricks. In fact, Extreme Pogo is actually a sport (also called Xpogo). What should I look for in a pogo stick? So, how do you decide which pogo stick is the best pogo stick for you and your family? The first thing you need to know is that you need to put a fair amount of weight into your bounce to get the pogo stick to work. The spring inside a pogo stick can be fairly tight and may require some breaking in to loosen it up. This is for your own safety: a stiff spring keeps you from making a high impact collision with the ground when you descend from your bounce. Therefore, a good pogo stick will likely feel stiff when you first use it and needing to break it in is perfectly normal. Always start by checking the weight restrictions on your pogo stick before you buy one. Pogo sticks are built with different springs for people of different weights. Buying a pogo stick for a weight range that is higher than your own can result in you being unable to use the pogo stick. This is because your body weight might not be enough to get the spring to compress effectively. If the spring cannot compress, it cannot release in order to propel you into the air. Similarly, buying a pogo stick for a weight range that is below your own can result in injury. If you are too heavy, your weight may be too much for the spring to handle. This can result in a painful impact with the ground on descent, because the spring is not stiff enough to absorb your weight before it hits the ground. The weight restrictions are the main thing to look for when buying a good pogo stick. Depending on how much you use your new pogo stick, you might also want to look for durability. The best pogo sticks should be able to last you a very long time. The current world record for the longest distance travelled on a pogo stick is approximately 42km, so it should take a lot of jumping for you to wear yours out. You should be able to get a good pogo stick for $30 to $80. Several retailers like Target and Walmart sell pogo sticks. But the best place to buy pogo sticks is online. We recommend Amazon since they have the best customer service, the lowest prices and pretty much all pogo sticks available out there. The modern pogo stick was invented by Max Pohlig and Ernst Gottschall, from Germany. There is a German patent registered in Hanover since 1920 for a spring end hopping stilt. The name comes probably from the inventors last name Pohlig and Gottschall. But there's also a story about a Burmese girl named Pogo. There are plenty of choices out there for you to choose from. This can make picking the right pogo stick for a child, your older child and yourself slightly chaotic. 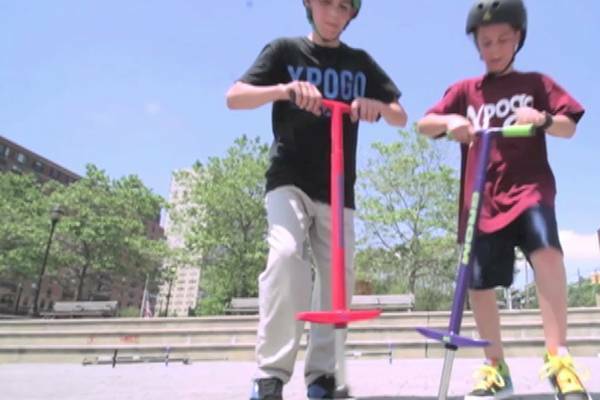 We took the time to go over a wide array of different pogo sticks, and here is what we found that may provide a solution for your bouncing needs. If you are looking for a pogo stick for toddlers, you should check their weight before you purchase this pogo stick. Make sure your kids fall within the recommended weight range of 40 to 80lbs before purchasing, or else your child might not be heavy enough to get the pogo stick to bounce. The Flybar Foam Maverick is made to be safe for young kids. It comes with easy grip handles and non-slip footrests to make the pogo stick easy to hold onto while bouncing. It is also made with a replaceable rubber tip to help kids keep their balance and reduce slipping when they bounce on their new pogo stick. Also, the spring is fully enclosed to prevent accidental injuries, and the metal frame is enclosed in foam to protect tender knees that might bang against the frame. The Flybar Foam Maverick Pogo Stick is a great pogo stick for young kids who are just learning to use a pogo stick. As a pogo stick for kids, the Foam Maverick is safe and durable. Younger children and toddlers are not always careful when they drag their toys around, but the Foam Maverick has been said to hold up against this kind of wear and tear by kids. You can expect the Foam Maverick to serve as a good pogo stick for kids until they outgrow the weight restrictions and need to move up to a bigger pogo stick. The Foam Maverick is also fairly affordable as a pogo stick for kids, who are constantly growing and will eventually need a heavier weight pogo stick. Overall, the Foam Maverick has received stellar reviews as a beginner pogo stick for kids. The main complaint against the Foam Maverick seems to be that younger, lower-weight children have a hard time getting the spring to bounce. As mentioned above, needing to break into a pogo stick is not unusual. The stiffness of the spring helps keep you from bottoming out, so it is natural that the spring will need some warming up before you can achieve maximum bounce capacity. However, younger children might have a hard time getting the spring to compress with their little body weight. It might be useful to have an adult break in the spring to get it bouncing for them. Also, users should be aware that it takes a fair amount of force to get the pogo stick to bounce. Kids will need to jump onto the pogo stick with some force; standing on a pogo stick and trying to force it to bounce is not likely to be effective. With a pogo stick that can handle up to 140 lbs, kids have lots of room to grow before they will grow out of this toy. In fact, some kids will not outgrow this weight limit even as adults. This makes it well worth the one time investment for your kids. Plus, the Razor Gogo Pogo Stick is said to be very durable, so you can expect it to last for a long time. It’s built with an aircraft-grade aluminum frame to handle rough handling. The footrests have replaceable pads, so you can buy replacements if your kids (or you) wear them out from all the bouncing you do with your pogo stick. The folding handles and footrests also make the Razor Gogo easy to store if you need to put it away for the winter. If your kids take a break from the pogo stick for a while (as kids often do with toys), you can slide the pogo stick into any small space for easy storage. However, it is important to note that the Razor Gogo does not fold in half. So don’t expect your kids to be able to pack this pogo stick into their backpacks and bring it to a friend’s house – it will have to be carried the old-fashioned way. Customers have found that the Razor Gogo is quite stiff for children of lower weights. It seems that especially for children weighing less than 80lbs, they might have a hard time getting this to bounce. An adult might be able to break in the Razor Gogo to make it easier to use. However, some adults have said that even they had a hard time getting this to bounce. This means that the Razor Gogo might be a better pogo stick for older children or teenagers. This is not your best choice as a pogo stick for toddlers or for young kids. As mentioned above, the pogo stick spring will likely take some breaking in and will need some weight to get it bouncing. While it can be used for kids, users should keep in mind that this is one of the higher weight ranges available for pogo sticks. Thus, this is probably best for older children and teens who have the weight required to get it bouncing. Flybar recommends this as an intermediate-level pogo stick. It would be the best pogo stick for those who already have some experience using a pogo stick and already know how to keep their balance. However, beginners should still be able to use it with practice. With a higher weight range than many other pogo sticks for kids, the Foam Master can handle adults up to 160 lbs. This makes it a good source of fun and family exercise. Its adult-friendly nature means the Foam Master can provide fun to the whole family. Consider having family competitions to see who can do the most consecutive bounces! Everyone can take turns using the Foam Master (subject to the weight restrictions, of course). It can also be used as a source of exercise or entertainment for adults alone. As a model more appropriate for heavier weight adults, the Foam Master is durable and also heavier than models meant for children. This is probably only a con because the Foam Master is said to be recommended for kids as young as 9 years old. Many users have found the Foam Master too stiff, too large, or too heavy for younger children. However, other users have found that their kids have no problem with it. If you are concerned about your child being able to use this pogo stick because of the higher weight range, you might want to consider other pogo sticks for kids. Perhaps consider a pogo stick with a lower weight range, even though the Foam Master can be used by kids 9 years old or older. The entire pogo stick is made of safe, non toxic and welcoming foam from the base to handle. Your child will experience comfort, and the fun they’ve been asking you for. You might be thinking the all foam Flybar is flimsy and lightweight, but you would be surprised to find out that it’s not only durable and strong, but it can support the weight of most adults. So not only will your four year old be able to elevate up and down safely, you can get in on the fun when they are fatigue. 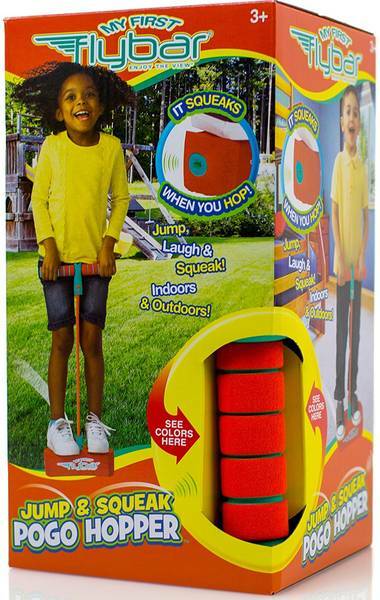 While the Foam Pogo Jumper is meant for ages 3 and up, the reason this is so popular with customers is the ability to be used by the entire family. A built in squeaker inside the base provide a real-like pogo experience. As far as the foam frame, it is soft and comfortable. The built-in speaker is optional, meaning you can take it out if you need or want to. So how do you make foam spring? WIth the help of a bungee spring material, that is stretchable and strong. The bungee spring takes the places of a handlebar being able to adjust the height or position. The bungee spring will accomodate most heights and is incredibly simple to use. You simply pull up on the handle and jump away for elevation. The harder you jump, the higher you go! This allows your child to control their bounce with added comfort in mind. One of the drawbacks of a typical pogo stick is not being able to use it indoors because of the materials scuffing up or scratching your floors. While some models have come into fruition to help with that, most pogo sticks tend to be loud. With the Flybar Foam Pogo Stick, you can take it outdoors and use it on pavement or grass. And when you’ve had enough sun with the kiddos, bring it indoors for safe use and much quieter fun. The handles are made as foam as well. Customer gloat about the handles being so soft and comfortable, but also durable and long-lasting. The handles will allow your toddler or little one use their pogo stick with all day comfort. The more comfortable your child, the more secure and confident they’ll be to graduate onto a traditional model. Not a fan of orange? The Flybar Foam Pogo Stick offers four colors: blue, pink, red, and orange. The entire pogo stick is light, soft, and fun to look at. There’s also a Hello Kitty model available if your child is a fan of that. The pogo stick is easy to set up for instant fun that is safe and colorful. Fun for everyone, holds up to 250 pounds. ​Multiple color options for boys or girls. ​Easy to use, sturdy and reliable. ​Soft and comfortable to use. There is no warranty on the product, which is a concern to certain customers. The built-in squeaker can be annoying. Most customers think the squeaker is loud and breaks easily. If you aren’t quite sure about a typical model pogo stick, then the Flybar is your best option. It is made to do everything your average pogo stick can do, but in a much more delicate and safer way. The colors and designs make it fun and optional, the handles bring a level of soft all day comfort, and the base is reliably sturdy and made durable to last. When you’re looking to buy a pogo stick, a few things to weigh, are weight and age restrictions. What may work for your 10 year old could be a disaster for the 5 year old child. Fisher Price is an entity in the toy manufacturing world. Since 1930, Fisher has been producing award-winning, innovative and safe products for children of all ages. They don’t disappoint with the 3 in 1 Grow To Pro Pogo Stick. What makes this such a great pogo stick is that you can purchase it for a beginner, and it can be used by your older child, who already has the skills at bouncing with the pogo. Most parents have expressed such joy about the confidence their children have gained from using the base of this colorful 3 in 1 pogo stick. And once your child does the same, you can easily detach that base, and allow your kid to use the motions they learned from the base by using the internal spring system. The old idea is to see your child’s progression as they continue to practice. Once they start bouncing on the traditional base, they will be able to use the Internal Spring System to reach a height of 3 to 5 inches. Oversized grips won’t teach your children a thing about learning the pogo stick, especially if they aren’t comfortable. The material used on this pogo stick is colorful and comfortable plastic, nothing that’ll hard your child’s hands. The Sure Grip Handles that come with this pogo stick aren’t meant to give your kid the best firm grip and sense of security as they take off into air. One of the most intimidating aspects for a child learning to jump on the pogo stick is stepping onto the pedals. With the Fisher Price 3 in 1 Grow To Pro, your child will thankfully never have that fear. That’s because it comes built with an extra wide surface, so that children of all sizes can safely and surely step and bounce with ease. The surface is made with skid resistance, which helps your child with balance, fall protection, and traction. Before you know it, your 5 year old will be bouncing with the 8 year old. This is a great pogo stick for many reasons, but one of the biggest reasons is the weight and age limits. This will hold up to 60 pounds, and the age group recommended is from 5 yrs to 8. If you live in a neighborhood with a lot of children, or perhaps you have a few of your own at different ages, you can use this 3 in 1 to cater individually to those children. Or, if you only have one child, you can watch them grow into pro, and after they lose their beginner status, remove and ditch the base and watch them bounce. Finally, while the materials are plastic, the components used to make this pogo stick are sturdy and durable. The base is certainly solid enough to withstand impact of your beginner child bouncing up and down. The colors are a mix a of a blue, green, and orange, throughout the pogo stick, which makes it an appealing theme for your child to gain interest with. Made by a reliable and innovative toy manufacturer, Fisher Price. Durable and sturdy base that is great for confidence. ​Great for the neighborhood and birthday’s. ​Weight limit of 60 pounds. ​Compact and easy assembly. Instant fun. The spring is a little noisey, many customers have complained about it being squeaky. You may be able to provide a little oil to fix it. Helmet or elbow pads not included. Springs can stiff for certain children. This is the perfect beginner pogo stick, and a must have if your child suffers with confidence. The safety values that this is built with will be enough to win over your confidence, that this pogo stick is safe enough to hold and teach your child. The Vurtego V4 Pro can be used for Xpogo activities or you can simply use it for fun or exercise. Vurtego believes that size says everything about a pogo stick. If you jump with the correct size, you are more likely to have a safer and more successful bounce. The three sizes are small, medium and large. While the manufacturer claims that there is no weight cap on this V4 Pro, it is recommended that nobody over 400 pounds use it. The lowest recommended weight is at 75lbs. What makes this one of the most advanced models out there, what separates the VP Pro from other pogo sticks, is how you spring. The adjustable air pressure provides 10 percent air from the V3 model Vurtego produced, in which the elevation of your bounce is controlled on how much air you pump. Ordinary springs can’t adjust as easily as the Vurtego V4 Pro can. Pump it to a low pressure for a limited jump. If you pump more, it’ll stiffen the springs causing it to jump higher, and if you pump too much air, the pogo will stagnate until you release air. Many customers adjust it based on personalized preference. If you have a companion, you can easily adjust to their preference, and vice versa. With these pegs, you’ll always have safe footing and landing. Vurtego updated their traction pegs with a coated powder to give the pogo user an ultra-grip. The added and secure traction will allow you to safely land your jump. Whether it is for leisure or for sport, the traction pegs provide the grip you need for maximum performance. The V4 Pro’s cylinder is scratch resistant and strong thanks to the materials used on it. Made out of durable 6061 T6 Billet Aluminum, you’ll never have to worry about a compromise in the structural integrity. A strong frame makes for a stronger pogo bounce, and you can jump with confidence knowing that the frame is safe and durable. The V4 Pro produces less noise and more air. That’s done by an update shock absorber that brings in much better circulation. This will give your jump much more bounce, and with the new shaft that has been integrated, the V4 Pro is able to bounce up to ten inches. This model provides 2 inches of extra shaft, to give you more air when you jump. Great customer service and made in the U.S.A: quality inspected and rigorous inspection. Can be used by the whole family with versatile sizes and weight limits. Can be used for sport, crossfit, or other exercises. 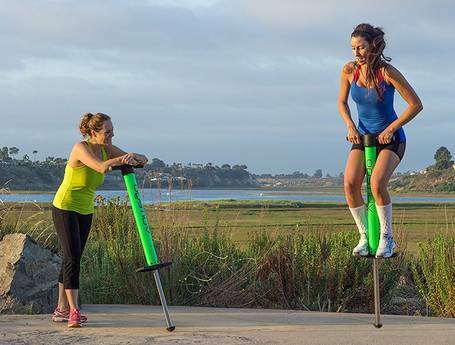 Very expensive: This isn’t your typical pogo stick, it’s an investment. Some customers say it takes patience to get acquainted with the technological abilities of the pogo stick. While the price tag may be hefty, and it’ll take time and due diligence to get used to, the Vurtego V4 Pro is something that will last you for many years. The V4 Pro is made in the U.S by a reputable company, that has paid close attention to making this the most viable and advanced pogo stick on the market. Considering that you can adjust the air pressure to better suit any user, and the fact that it comes in three sizes, this is a pogo stick that can be used by a family with teens. Pogo sticks are a lot of fun, fun that has been around for roughly a hundred years. Things have changed since the first two handled model released in the 1950’s. With that in mind, you now have so many options available at your disposal. As you read above, certain models are geared towards certain pogo users. If you have a teenager, then the Fisher Price 3 in 1 model won’t make sense, just like the Vurtego V4 Pro wouldn’t be safe for your four year old. Always look for weight and age limits listed on the model box. Certain models are better than others. Always look for something with slip-resistant, so that your child will have the best traction to safely jump. Can your kiddo adjust the handlebars? Does the pogo stick come with removable footpads and tips? Are the tips rubber and safe on floors? These are things you will want to consider to meet your safety requirements. Some models are as low $20, while others can go as high as $400. Generally, you can find a good model in the $75-$100 range. If you are on a budget, it isn’t impossible to find something safe and effective at $50. The biggest thing to think about when you buy a pogo stick is the size and weight restrictions. As these product reviews show, buying a pogo stick that is not appropriate to your weight can leave you unable to use your new pogo stick. Make sure you check the weight requirements, and if possible, buy a pogo stick where your weight is in the mid-range of the weight listed. If your child weighs 50lbs, the Foam Master is probably not going to be your best choice because it ranges up to 160lbs. It has to have a stiffer spring to handle that weight, so will likely be more difficult for your small child. In general, the Foam Maverick is probably the best pogo stick for toddlers, and also for younger children. The Razor Gogo will be the best pogo stick for older children and preteens up to 140lbs, and the Foam Master will be the best pogo stick for older teens or adults up to 160lbs. All three of these pogo sticks appear quite durable, though there have been some complaints about the tearing of the foam on the Foam Master. Both Flybars have replaceable rubber tips available, which is something to keep in mind if you think your pogo stick will get a lot of use. Pogo sticks are a great family fun activity as well as a test for individual endurance and performance. Finding the right one, will be a trial and error effort for you, but as long as you stick to the guidelines and research the model before you buy, you will find a pogo stick that meets your family’s needs for fun and safety. And finally, remember to be safe and wear appropriate safety gear to prevent injuries.